There is so much talk these days regarding the end of the FED’s QE2 or quantitative Easing part 2 that has resulted in both professional and amateur investor confusion. Add to the mix the constant MOPE (Management of Perceived Expectations) from “B52 Ben’s” minions and throw in to the mix the bloviating statements put forth by everyone’s favorite Treasury Secretary “Turbo Timmy” Geihtner all contradicting themselves also has set the stage for the investment community to be off kilter. Of course keeping investors off balance and guessing is exactly what the FED and other players want as each has their own agenda and is basically playing for time. 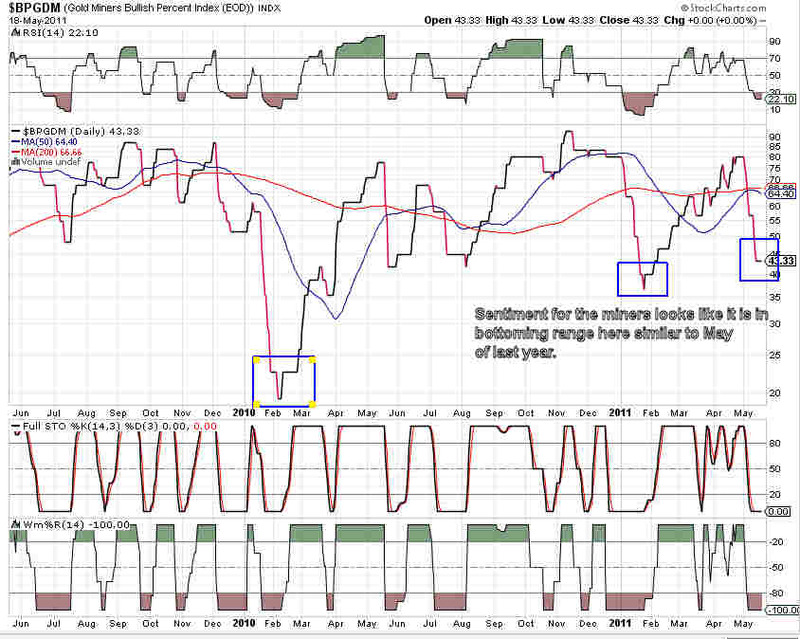 In my mind there is no question that QE3 is coming of course I cannot tell you at what point she will dock. It is also doubtful that QE3 would be called by that moniker but “a rose by any other name would still be a rose”. I highly doubt that QE3 would sail on in right after the end of QE2, instead we will see games played with the FED’s bloated and highly over valued balance sheet. I believe it was James Rickards who coined the QE Lite term and that is what I believe the FED will engage in. The FED will use maturing debt and interest earned to reinvest in treasuries essentially keeping the music from stopping. The amount the FED will be reinvesting will be sufficient to avert the catastrophe of full detox shakes required to actually right the economy but not enough to stave off the withdrawal pains. Instead I believe the FED is playing for time and actions have been taken to essentially create the façade of credibility so that they can jam QE3 down our throats when the economy is looking like the music is stopping again. I have noted in the past that the FED is taking a page from the French Assignat playbook of the late 1700’s that ultimately lead to worthlessness of that currency. The French economy was in the doldrums and the government printed a bunch of Assingats and the economy would act much better for a while. Going forward each time the economy of France slowed sufficiently the government would print more Assingats and things would get temporarily better, until they just didn’t as the Assignat was toast. Today we have fancy names and methods for hiding money printing and devaluation but semantics aside the end destination is the same. No different than a wife making excuses for her alcoholic husband we hear from all levels of government, economists and media that the Dollar cannot be replaced, or will not lose its reserve currency status. I want you to think dear reader about what has transpired in the last decade, no better yet even the last couple years. Would you have believed that GM could become Government Motors, or that Wall Street would be bailed out or the mortgage mess could have occurred? Would you have envisioned the changes going on throughout the world from natural disasters to political upheaval? As humans we have a tendency to extrapolate the future by looking to the past, however, this is not a correct assumption. As the 18thCentury Scottish Philosopher, David Hume posited, there is no real reason to believe that future has to resemble the past in fact it could be argued that it is an irrational expectation to believe so. In other words humans tend to be guilty of linear thinking that just because it was so before so shall it be forever. Of course the idea that the past dictates how things will be in the future is a silly notion, just look in your own life for proof on smaller scale. Take the internet for example, many of us had newspaper subscriptions and had the paper delivered to the house. If I had to guess today judging by circulation numbers that most of you reading this missive get your news through an alternative to actual newsprint, probably online as I do. By thinking in a linear fashion it would have been assumed that everyone would continue to get their news via printed materials delivered to their home, but clearly something has changed. Even the financial industry gets this concept as they constantly proclaim past performance is not indicative of future results. Yet the economists and media pundits continue to utilize linear thinking applying it to things like the Dollar, real estate, reserve currencies, US Government debt and infinite number of other things. The changes we are discussing take time and some even move at a glacial pace, but they do move. To me the move away from the Dollar as a store of value let alone the world’s reserve currency has been moving at that glacial pace. It is more akin to the shifting of tectonic plates on the earth’s crust. The plates that make up the continents are in continual motion that is imperceptible to us building pressure as the plates move and when the tension achieves its maximum it results in an earthquake. The continual drama we are living through with our economy is building pressure on the tectonic plates that hold the Dollar and US Government debt. At some point the plates will shift and all the economists, politicians and banksters who currently say that it is impossible for the paradigm to change will be wrong. I do not know when, but I do know that the paradigm will shift. There will be some event that will cause governments and people around the world to shift away from Dollar assets and or demand higher rates of interest and payment regardless of what today’s experts say. If you could travel back in time and go to a pub in England in the early 1900’s and tell the patrons that the US Dollar would supplant the Pound and that England would become but a player in the US’s shadow they would have thought you a lunatic. Flash forward to today and we have and establishment dealing with the problem of our debt and spending, and unfortunately at all levels these people think in a linear fashion and look to the remedies of the past to fix the future. If one throws in to the mix the notion that all sides have an agenda which do not necessarily lend themselves to the best interests of solving the country’s problems. Instead we have two ideological points of view both out of touch with reality that promotes each side’s unyielding view of what they want the US to be like. I can remember growing up watching what used to take place in Washington seeing the politicians sparing with each other over issues but eventually coming to a compromise and then going out for drinks after session. Today the object of the game is to block your opponent at every step and vilify them in the media not exactly an atmosphere conducive to problem solving. It could be that the rest of the world has sensed that not only are we at a crossroads fiscally and economically but they also are voting by not automatically running to the Dollar. Avoidance of the Dollar was best exemplified when the crisis erupted in the MENA (Middle East and North Africa) and instead of running to the safe haven of the Dollar people around the world moved in the Swiss Franc, gold and silver. Before Silver did its now famous swan dive as a result of the 5 CME margin hikes in 8 days all I kept hearing about was how there were something like 99% Dollar bears and that the dollar was to embark on a multi month rally as a result. I did not buy the premise then and I don’t buy it now that the dollar is going to run up to the 80’s on the DXY. 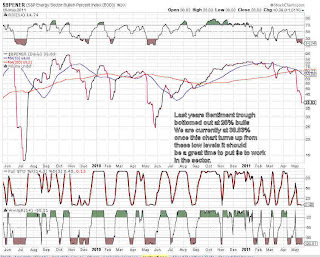 The latest evidence I have shows that while the trade may have been crowded the supposed rally is not nearly robust as one was lead to believe. 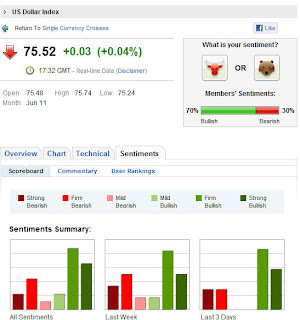 The open interest in the Dollar has remained rather flat all the time that it has been rising. Additionally, the commercial players who are right the vast majority of the time have reduced their position during this rise while the large longs have somewhat increased their position. 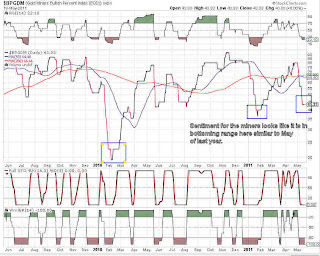 Conversely, if you look at the chart below you can plainly see that throughout this supposed rally in the dollar that the small speculator open interest has gone parabolic. To me the fact that the small spec is fueling this rise and the strong downtrend is in place says this is nothing more than a short term bounce. There are those that argue that because the Dollar on the DXY exceeded its 50 day moving average that it is in rally mode, but just as we have seen in gold, silver and equities moving above an average particularly in a down trending bear market is no guarantee that the rally will continue. I believe instead that the current Dollar uptick is in the process of exhausting itself either at this level or by the time it gets to 77.5 near the major downtrend line (assuming that it can continue to climb) and then will resume its trek down toward the 64 level as my initial target. 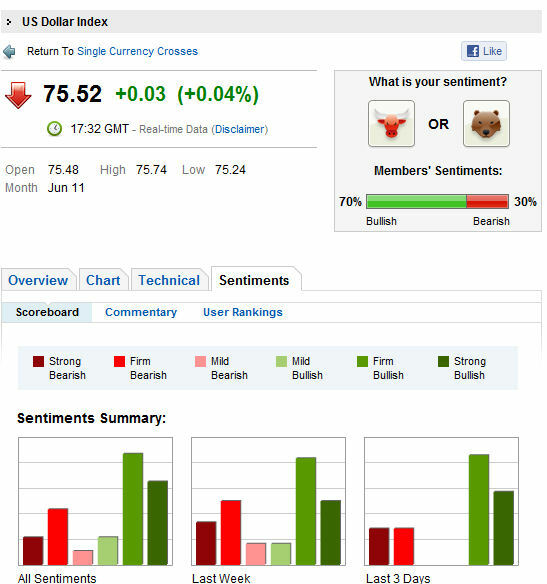 Sentiment indicators from Forexpros.com for 5/18/2011 and last week. Assuming that the Dollar does continue its decline then that would be bullish for the equity markets and in particular for the energy stocks and precious metals group. 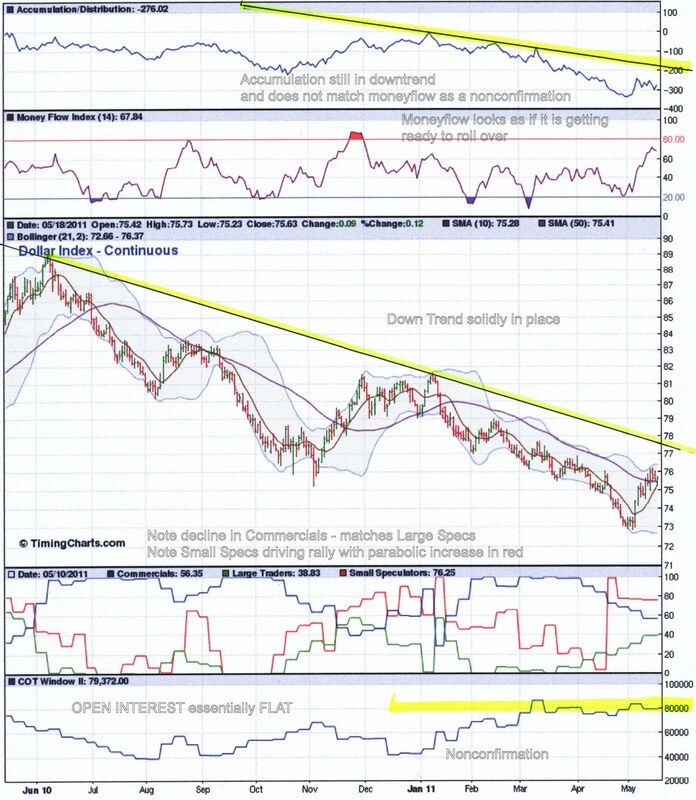 The sentiment in the precious metals group is at a level where the issues could rally, while if history holds true the energy sector still has some work to do. 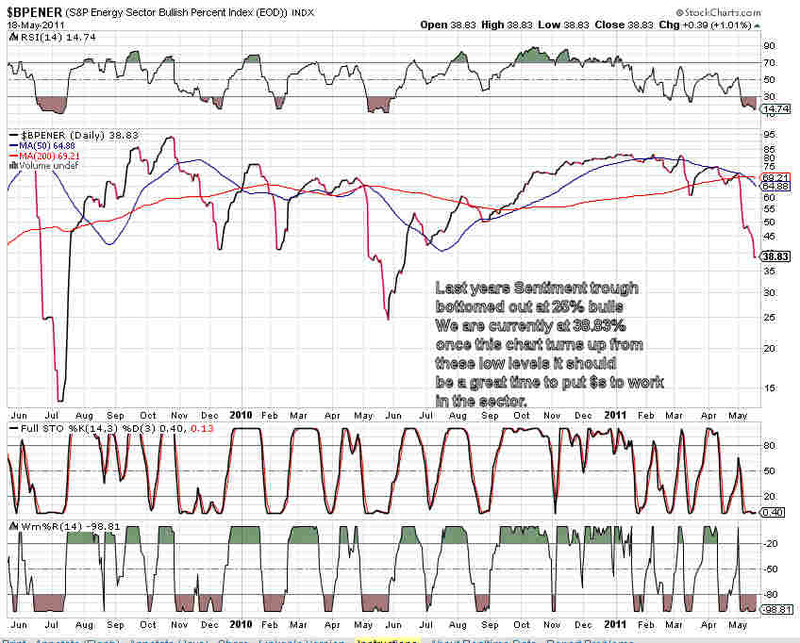 There are a couple charts posted below showing the bullish percentage for the energy sector and the precious metals. In the energy sector there are lots of names to choose from like the large caps Conoco (NYSE: COP), Chevron (NYSE: CVX), Total (NYSE: TOT) or smaller plays like Occidental (NYSE: OXY) and Satoil (NYSE: STO). I personally like Statoil and Occidental as I believe that provide excellent value and potential as the oil shares turn around. Statoil is a Norwegian oil producer which like many of its brethren had gotten beaten down as a result of the current dollar rally and the oil futures margin recently implemented by CME Group. Statoil is a solid company that is currently trading at about 7.5x future earnings and is currently oversold. Statoil is very attractive at today’s price level. Occidental Petroleum is an independent Oil and Gas producer that has been a great performer in the past and is currently completing a pull back and bounce off of its long term uptrend line. OXY is currently oversold and should rally nicely with the rest of the oil and gas sector. OXY is projected to grow earnings on the order of 52% for 2011 and looking forward to 2012 earnings are supposed to grow 16% as well. I have owned OXY in the past and it is a very good company and has delivered well in the past. OXY sports a forward PE of 10.6 and a PEG ratio of 1.14 so it is not overly expensive; and as a bonus you collect a 1.8% dividend to boot. I believe that OXY is very attractive at the current level. 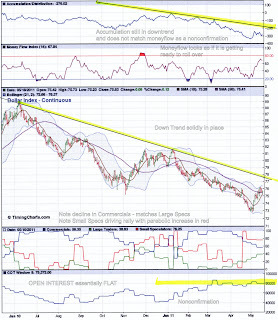 The precious metals are actually in very good shape from a sentiment perspective and this suggests that the shares are close to if not already mmaking a bottom. As for the precious metals there are many to choose from but I prefer to buy intermediate producers and a couple of the majors. The miners I favor once the sector gets some legs are GoldCorp (NYSE: GG), First Majestic (NYSE: AG) , SilverCorp (NYSE: SVM), Newmont Mining (NYSE: NEM), Silver Wheaton (NYSE: SLW), Yamana Gold (NYSE: AUY) , US Gold (NYSE: UXG) just to name a few. If you want a diversified basket of larger and mid cap miners then save yourself the aggravation and just buy the Market Vectors Gold Miners ETF (NYSE: GDX). On the other hand, if you are looking to invest in juniors my best advice is to either use the ETF Market Vectors Junior gold (NYSE: GDXJ) or look in to the Tocqueville Gold Fund (Mutual Fund : TGLDX) run by long time gold mining portfolio manager John Hathaway. I suggest the two options above for investing in juniors because it is much more complex to assess the juniors that will be successful versus those that will always be just a hole in the ground. Investing in juniors requires knowledge and research that most investors do not have so the funds mentioned are a better alternative. Well that is it for today and I know that this missive kind of ran the gambit and I apologize for that, but I hope you still enjoyed the piece.